"My influences come from real life. I'm not interested in cinema for cinema's sake. I'm interested in life—what one does and how one interacts"
You may agree or disagree, but Steve McQueen's Bullitt is a bloody good movie. The crime caper is loaded with mystery, action and American Muscle Cars. The perfect combo for a killer Sunday movie session, unlike the very commercial Fast and Furious saga that's been dragged out into multiple generations of cinema. To be fair I won't knock the movies as they're an easy watch if you can't be bothered to spend 5 minutes choosing something else. Anyhow, back to McQueen and his well-known character Lieutenant Frank Bullitt. To cut a longs story short, McQueen is called upon to protect an ex-mobster [Johnny Ross] from being killed before testifying against the organised crime gang he recently defected from. If you haven't seen the classic thriller I suggest you stop reading now. The witness gets hunted down by the mob's hit men, and has a few shotgun shells pumped into his chest. McQueen and his men are blamed and the story starts to take some interesting twists and turns from there. The first being McQueen never deviates from his own classic personal style. A pair of straight leg chinos, rugged shirts, cable knit crew neck sweaters [or a turtleneck ] and a solid pair of boots. [Chukka or Deserts] McQueen's style is effortlessly laid back, yet smart enough to be worn for a variety of occasions. The second aspect of Bullitt that seemed to grab my attention was McQueen's environment. It's nostalgia that wins every time, I mention this as I think about my own day to day profession in Digital Brand Marketing. When strategising, curating and deploying campaigns, I’m constantly thinking about creating content with intent. A smart way to go about the creative content process is to contextualise your vision and define how it can be best consumed. [in short, it's somewhat reverse engineering the outcome] I focus on doing this because I know, and feel trends are cyclical, and watching classic movies like Bullitt really do make you think about how we as consumers and brands are functioning. The hype of influencer marketing and content creators is still buzzing around, although if you really know your stuff, this is a game that has been played for over 50 years. The whole Steve McQueen package became a brand in itself, oozing style, confidence and mystery. Steve McQueen was and is still one of the worlds biggest ever influencers for many different reasons, one being he was crowned by his followers as The King of Cool. 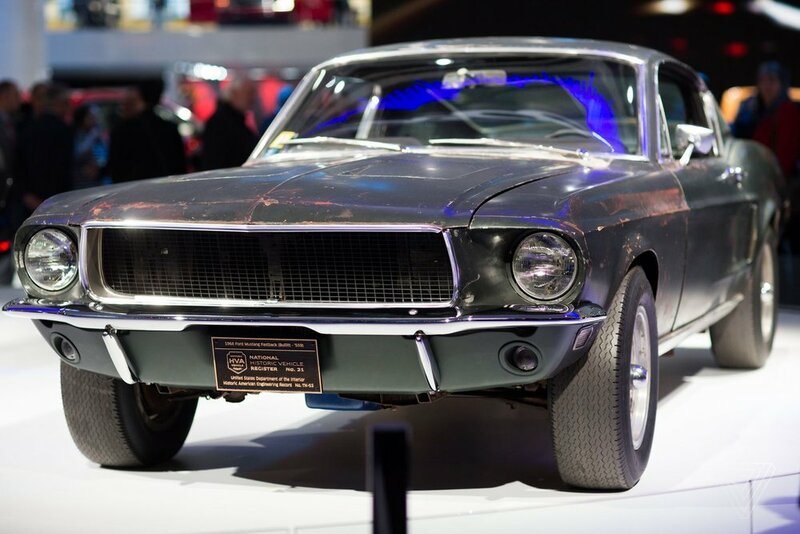 The motor companies Ford and Dodge jumped on the Bullitt band wagon and supplied Two classic Mustangs and two Dodge Chargers to Warner Brothers as part of a promotional loan agreement. The famous Highland Green 390 Horsepower Mustang was driven by McQueen throughout the film. Once filming had come to an end, an employee of Warner Bros bought the less banged up Mustang from the film set and has stored it in an abandoned barn in the USA. It was then sold for $6000 to to a New Jersey police detective named Frank Marranca, who then sold it on for $6000 to Robert & Robbie Kiernan (now days this is said to be around $42k). McQueen himself was said to have offered to buy the iconic car from the Kiernans, although they rejected the offer. The classic 1968 Fast Back Mustang has made headlines recently due to Fords Release of a new 2018 Limited Edition Highland Green Bullitt Mustang. Sean Kiernan son of Robert, drove the original Bullitt Mustang to the Detroit Motor Show this year. The two cars were proudly lined up next to each other, this is somewhat an iconic moment for both vehicles. I'd beleive I pull a lot of my own personal style from icons such as McQueen. As mentioned in an earlier journal post, I keep things simple and comfortable. Don't get me wrong, I like to change things up every now and then and try new ways of wearing products. As you'll learn I'm a sucker for my rugged simple fits, plain tees and the occasional mix up between classic casual and new-wave modern apparel. It's clear that I stick to staple pieces and enjoy the clothes I wear. Let’s cut to the famous car chase. Firstly hats off due to the production team. The cinematic quality is outstanding throughout and the way it was filmed back in the day must have been pretty epic, and nowhere near as easy as it is these days. McQueen finally gets the chance to chase down the hitmen that killed the witness from earlier on in the film. I'm always one for some quality music when watching an intense bit of action during a film. Although I absolutely love the fact there’s no speaking, no music and no technology to interfere with the pursuit. It’s pure engine, burning rubber on tarmac and speed. "I learned that life is a long and difficult road, but you have to keep going, or you'll fall by the wayside."